The U.S. Supreme Court on Sept. 29 agreed to hear arguments from a group of New York merchants who want the right to impose surcharges on purchases made with credit cards. The outcome of the case could have an effect on laws in 10 states that restrict such surcharges. 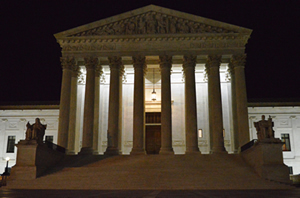 The Supreme Court granted a writ of certiorari the merchants filed in May 2016, after a lower court upheld laws banning such surcharges—which the retailers say are necessary to offset swipe fees imposed by payment networks. The group of five merchants—which includes a Brooklyn ice cream parlor and a hair salon near Binghamton—claimed in its petition to the Supreme Court that banning surcharges is a violation of the First Amendment’s free speech protections. Although all states allow merchants to charge a higher price to customers who pay by credit cards, 10 states have laws that govern how those price differences can be communicated. New York law allows merchants to offer a discount for cash payments, but makes it a crime—punishable by up to one year in prison—to impose surcharges on credit card purchases. “Liability thus turns on the words used to describe identical conduct—nothing else,” the merchants argued in the writ. The New York case dates back to 2013, when the retailers challenged the law in U.S. District Court. U.S. District Court Judge Jed Rakoff ruled in the merchants’ favor, agreeing that the surcharge ban prohibited free speech. New York state, however, appealed and, in September 2015, an appellate panel reversed the decision. That led the retailers to petition the U.S. Supreme Court to hear the case. The Court said it will hear the arguments in the case during its upcoming term, which begins Oct. 3 and ends in June 2017. Merchants in other states also have argued that surcharge bans violate the First Amendment’s free speech protections, but the New York case is the first to reach the nation’s highest court. In 2015, merchants in Florida successfully used a free speech claim to strike down that state’s ban on surcharges—a decision that echoed a similar ruling in California. A Texas appellate court upheld that state’s surcharge prohibition in March 2016. The merchant plaintiffs in the Texas case also filed an appeal to the Supreme Court, but the court has yet to decide if it will hear that case.